Our charming new arrangement will transport them to a bustling floral market. Brimming with bunches of eye-catching blooms, our exclusive flower cart is gently brushed in soft blue with a vintage beveled design and garden imprint on front. Keep the fun rolling right along by reusing this whimsical piece for planting or holding gardening tools. A bright and vibrant mix of yellows, pinks, purples and oranges are brought to recreate a beautiful garden. A perfect gift for mom! 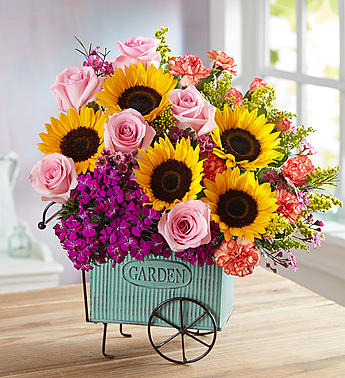 Send a delightful mix of vibrant flowers today! 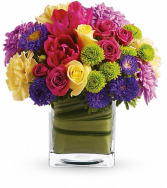 A colorful mix of pink tulips, yellow roses, lavender cushion, pink spray roses, and yellow carnations are brought together in a clear glass cube. 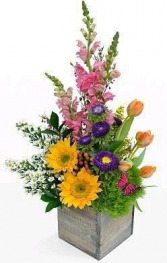 Celebrate your Mom's love with this beautiful arrangement and make her day more special. 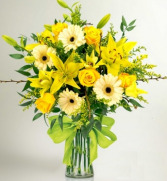 A mix of yellow roses with beautiful Gerbera daisies and lilies are sure to bring a little sunshine to someone special.